An endowment recently established by a former student will enhance the ability of a Texas A&M's College of Architecture research center to connect academia with the facility management industry. 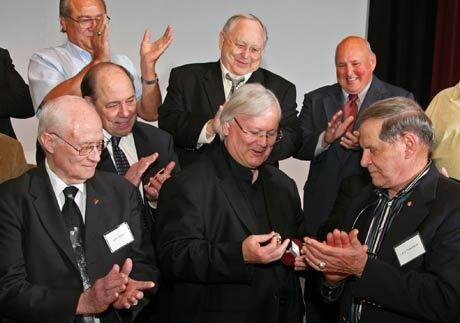 With a $25,000 gift to the CRS Center for Leadership and Management in the Design and Construction Industry, John Garcia, who earned a Bachelor of Environmental Design degree in 1983 and a Master of Architecture degree in 1985, established the Alpha Facilities Solutions Excellence Endowment. The donation will support facility management teaching, research and outreach, as well as the center's Graduate Certificate in Facility Management program. Helen Keaton ’85, an outstanding alumna of Texas A&M’s College of Architecture, and her husband, Glen, recently endowed a new scholarship benefiting students pursuing an undergraduate degree in construction science. Keaton, who earned a Bachelor of Building Construction degree at Texas A&M and who currently serves as vice-president of estimating and preconstruction services for Joeris General Contractors in San Antonio, was recognized as an outstanding alumna in October 2010. By overseeing Joeris projects from concept development to the bid process, she has helped Joeris become the San Antonio area’s second-largest contractor with a yearly volume of $250 million. 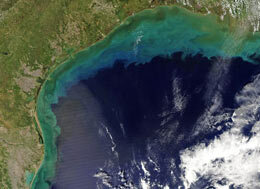 Funded by a two-year, $400,000 NASA grant, a Texas A&M at Galveston research team is investigating the amount of carbon sequestration capacity lost over the last decade from alterations to naturally occurring estuarine wetlands along the Gulf Coast. The multidisciplinary study, lead by principal investigator Patrick Louchouarn, associate professor of marine science, will examine relationships between carbon sequestration, coastal wetlands and changes in land use. For the scholarly potential of her research focusing on the sacred architecture of the Athenian Acropolis, Nancy Klein, a Texas A&M architectural historian, recently garnered a $10,000 research grant from the university’s Division of Research and Graduate Studies. The grant, awarded through Texas A&M’s Program to Enhance Scholarly and Creative Activities, will fund Klein’s study of architectural development on the Acropolis during the fifth and sixth centuries B.C. Students in Texas A&M’s Ph.D. program in Urban and Regional Sciences are conducting a study to project the potential economic effects on the Lake Conroe area when, beginning in 2016, some of the lake’s water is used to supplement the region’s water supply. In the Feb. 1, 2011 issue of the Courier of Montgomery County, Howard Roden reported that students will conduct a 16-month survey, funded by the Lake Conroe Communications Network, to forecast the effect on property values, sales tax revenue and employment after the San Jacinto River Authority begins pumping water. According to George Rogers, coordinator of the Ph.D. program, the economic study will include surveys providing “real behavioral data” obtained from a survey of randomly selected study participants. 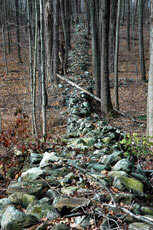 An article published in the current edition of Preservation Education & Research argues that preservation ordinances should be interpreted to include the protection of historically significant stone walls in North America, which are being deconstructed at an alarming rate to support commercial demand for stone building materials. The authors attribute the ongoing destruction of these historic artifacts to a lack of appreciation for stone walls reflected in national, state or local laws and ordinances, but suggests it is possible to make a case for their protection via the National Historic Preservation Act. Texas A&M urban planning faculty members Eric Dumbaugh (left) and Ken Joh (right) are researching mobility issues as Texas Transportation Institute research scientists. The two are working in TTI's Southwest Region University Transportation Center, which focuses its research efforts on enhancing mobility, accessibility and efficiency, promoting safety and a safe environment, development of the transportation workforce and supporting economic growth and trade. A Texas A&M doctoral student is investigating whether small neighborhood schools, when compared to larger suburban schools, better promote students’ walking to school and the social cohesion of the communities they serve. The one-year study, undertaken by Urban and Regional Science student Hyung Jin Kim and funded by a $124,680 Active Living Research Grant from the Robert Wood Johnson Foundation, will test these assumptions, which if true, Kim said, could help school districts design and place schools to take advantage of these trends.